NB: these are approximate currencies for planning purposes. For up to the minute rates please view an online currency converter. Anything loose fitting that breathes, remember it gets very hot in beautiful Bali. Ladies if you love dressing up in heels then take them if you’re visiting nice bars & restaurants, but NEVER wear them during the day, you’ll regret it! It’s too hot and your feet will swell. Wedges are the best choice if you love a heel as they take less wear and tear and navigate the holes in the footpaths and roads a lot better. Of course bring multiple pairs of bathers, but if you need more you can buy some here. Not always cheap though, especially if shopping around Seminyak! There’s Havaiana shops that also sell Seafolly swimwear. At Bliss Sanctuary For Women all your transport is taken care of. However if you do need to catch a taxi then be nice to the taxi drivers they are usually lovely and honest. Just make sure you ask for the meter to be started, or if you know where you’re going and how long it takes barter before your trip starts. If you find yourself at the airport without a transfer (obviously not if you’re coming to Bliss! )there are plenty of taxis and drivers that you can barter with. It’s 25 minutes from the airport to Seminyak (unless in peak hour or during special celebrations). So don’t spend more than $20 on a cab or RP 250,000 as a guide. Always hold on to your belongings when out (especially in Kuta) like you would at home, it’s no different really. Don’t carry your handbags on motorbikes as these can be grabbed. DON’T take your passport out with you – lock it in the safe in your room or have it held at reception in a locked box if you are at a larger resort. Only use your credit card in a restaurant or a shopping department store not at the markets – not worth the risk and better to barter with cash (IDR). No need for travelers cheques or money passports – there are plenty of ATM’s on every corner that are safe and convenient. There are many Commonwealth Bank ATM’s which have lower banking fees. I normally grab some IDR’s from the ATM at the airport as this way you get the best exchange rate on the day. If you have other currency then there are some very good exchange places that give good rates!  Make sure they are visa approved and normally if they have air conditioning then they are good! Always check your money after they give it to you and never let them touch it again after you have counted. They are amazing at reducing the tally in a flash! Quite an artform in the back streets of KUTA, though a dying one. The visa on arrival fee has been waived for a number of countries, including Australia, Zealand, Canada and the United States. There are a number of other countries also included on this list, so please check to see if your passport country is valid for a free visa on arrival. Should it not be free, a fee of US$35 is payable on arrival and can be paid in any currency and must be paid in cash. There is no need to apply for VISA’s before you arrive and no paperwork is needed when you get there if you are on a 1 month travel Visa. If you are going for longer you can get an extension of 1 month at the Indonesian embassy prior to your 30 day departure date.If you’re not sure about your countries status please double check online before coming. If you would like to Fast Track your airport experience and have someone there with your name as you first step into the airport to help you skip the lines it will cost you approx. $25 USD. This can be organised prior, or you can often find someone at the airport. This is not always available. Only 1 Litre per person is allowed – otherwise they will confiscate the excess at the airport. You must buy it duty free at the airport you depart from and make sure it is all sealed. If you’re coming to Bliss Sanctuary For Women we suggest you bring flavoured Vodka, tequila or Bacardi … as these are easy to mix with the yummy juices we have available. Alcohol isn’t included in the packages but we often have Bintang and left over spirits available. If you’re not sure, check with your hostess what to bring. Spirits are comparative prices in Bali but wine and champagne are extra ordinarily expensive! Even Aussie wines are about $80 a bottle for something that is considerably less at home. Beer is nice and cheap. Cocktails are quite cheap too depending on where you go. You can spend a little or a lot – depending on what you are after! This hot, new restaurant has a unique, playful take on fine dining. Designed to share, the menu is filled with flavours and texture all inspired by the seasonal produce from the island. 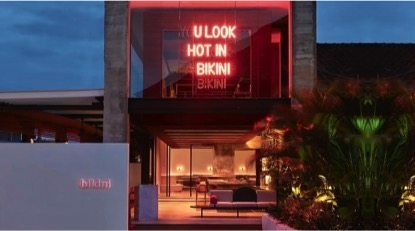 Bikini is a foodie experience and the cocktails are to die for. The food, drinks and stunning, chic interior all make you feel like you are in “the place to be” with its trendy New York vibe and energy. Dishes are pricey as you get what you pay for but if you are looking for a fun night that you will definitely remember, Bikini should be on your list. If you are looking for great seafood, Sardine will not disappoint. This restaurant, made from a beautiful bamboo structure is surrounded by lily ponds and rice fields. Make sure to get there before the sun sets and enjoy a cocktail overlooking the greenery before having dinner. Dishes are a fusion of Asian and Western food but the best is definitely the seafood. The vegetables come from Sardine’s own organic gardens and food is fresh and locally grown. 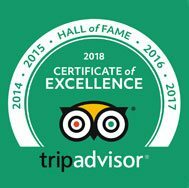 This restaurant is all about quality, service and a great experience. 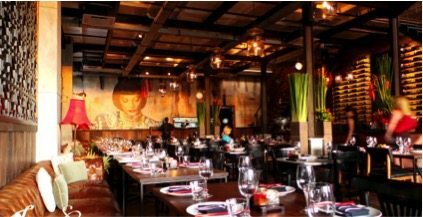 Sarong is an Indian Fusion Restaurant and is one of Zoe’s personal favourites. It is not like any Indian food she has ever tasted and the dishes burst with fresh, amazing flavours with every bite. A great idea is to order a number of starters to share, to taste it all and if you’re a seafood lover definitely try the soft-shell crab salad. Mamasan has amazing Asian fusion food from the same owners as Sarong. Enjoy lunch or dinner in the dining area down stairs but make sure to check out the trendy bar upstairs- perfect for before or after dinner drinks. You can choose share plates or main meals and yummy cocktails with a Chinese feel. This is a fantastic restaurant to check out. The concept behind Metis was combining French-Mediterranean dining, art and Asian culture. 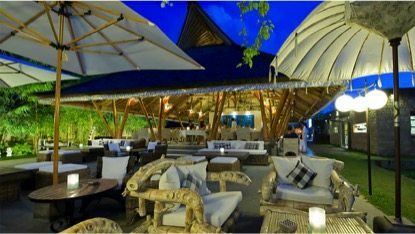 This fine dining restaurant in Seminyak not only has delicious food but a stunning setting, away from the busy streets. Metis has a restaurant section with an alfresco dining area looking over the tropical gardens, an under the stars dining setting and even a lounge where you can choose from the tapas menu and delicious cocktails. This is another fine dining restaurant in the heart of Seminyak for those looking for a true culinary experience. The restaurant has amazing architectural design with high ceilings and an airy cathedral feel. If you are looking for fine dining Indonesian food try Merah Putih for lunch or dinner. Order the small plates to taste all the flavours and be sure to try the Babi Guling (suckling pig). 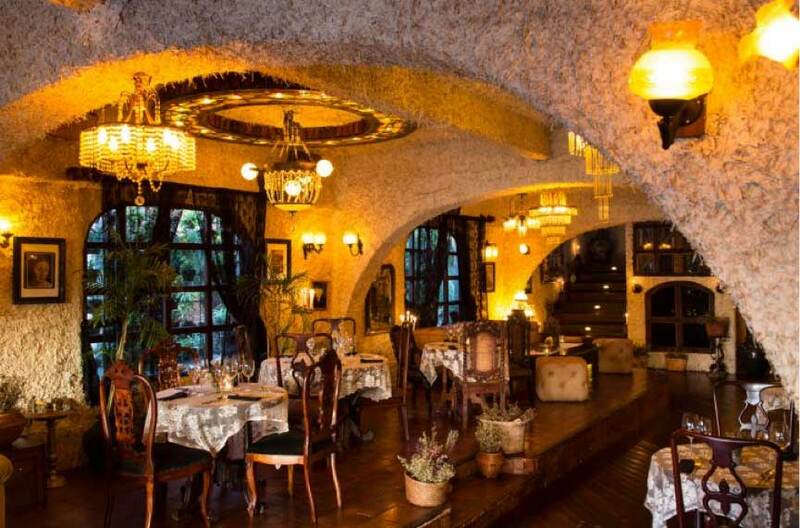 For a more quiet, cosy, romantic feel make sure to check out La Sicilia. Located near Seminyak Square, the building covered in beautiful ivy looks like it should be set in a narrow cobbled street in Europe. With beautiful Italian décor, relaxing music, quality wines and great service, you will enjoy Italian food with good ambience. On weekends the second floor opens into a club so if you are looking for dinner and dance try out this little gem. 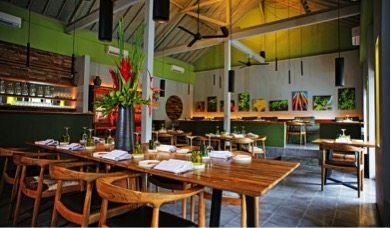 Previously known as 'Petitenget Restaurant', KILN in Seminyak is a bar and restaurant, inspired by Eastern Mediterranean style food. Dishes are cooked over fire in their signature copper oven and all their ingredients are sustainably sourced from the local area. KILN has a more “lounge” feel which is cool and casual with some of the best cocktails on the island. Choose from share plates, ale Carte style to a 5 course set menu, KILN is open for breakfast, lunch and dinner and has great vegetarian options so perfect for everyone. 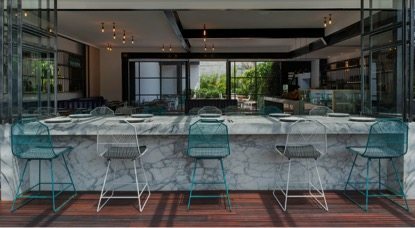 The newest restaurant in Seminyak, Salazon takes you on a dining journey and complete culinary experience. With a walk-in wine cellar, dry aging show room and open dining area. This is great for meat lovers, but they have amazing seafood and vegetarian options to choose from. The open kitchen allows you to watch the chefs as they prepare your food and a cocktail trolley with a mixologist who comes right up to your table and makes you what ever you want. Make sure to make a booking, as this is the newest, trendiest place to be. 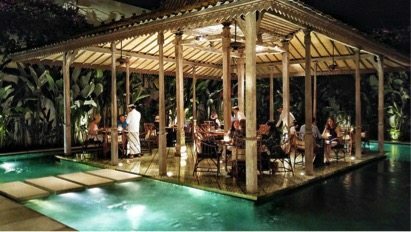 Hidden behind a large wall off the busy streets in Seminyak, enter into Bambu and feel as if you have stepped into a calm oasis. With a fish filled pond on the outskirts of the dining area, it feels like you are sitting on a floating terrace. The menu is all about contemporary Indonesian flavours and choose the option of spicy, medium or mild flavours. This is a lovely restaurant to visit for lunch or dinner. BBQ lovers..look no further. Barbacoa is dedicated to wood fire, charcoal, smoke and BBQ’s. Their menu is inspired by Latin American flavours and you can enjoy rustic local dishes for lunch, tapas or dinner. 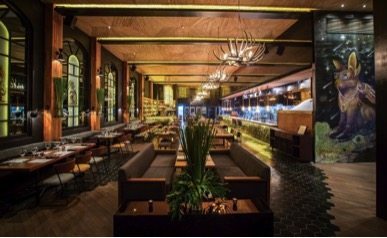 The restaurant has a warehouse feel with high ceilings, recylceld wood and vintage leather banquettes. 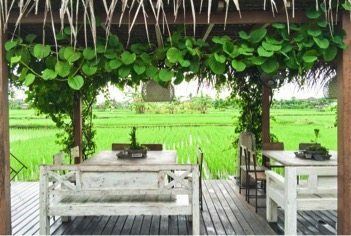 It is located next to the rice paddies so if you like the outdoors make sure to grab a seat outside and enjoy the view. If you love Mexican food, margaritas and are looking for FUN.. Motel Mexicola is where you’ll find the party. Neon lights, great music, the best Mexican on the island, and bustling energy- Mexicola allows kids for dinner but by 8pm it’s adults only. Mexicola is a fun restaurant, which turns into a bit of a party as the night progresses and by 9pm you’ll see guests dancing the Congo and drinking tequila shots. Highly recommended for a fun night out. 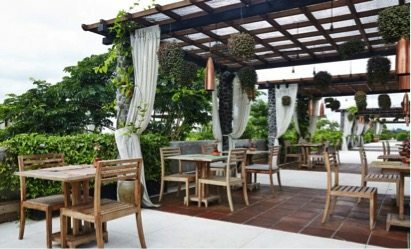 This Italian restaurant has stunning views of the ocean and looks out onto one of the prettiest stretches of Seminyak beach. It is great for breakfast, lunch or dinner and the Italian chefs fuse together Mediterranean food with an Asian touch. We recommend watching the sunset, sipping a cocktail and enjoying some really yummy Italian food. 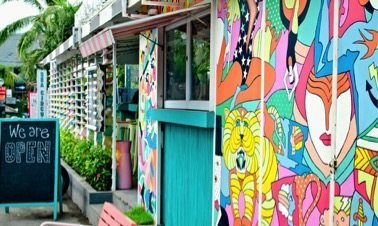 For a more relaxed café - this fun, colourful, buzzing café serves breakfast as early at 7.30am, lunch and dinner. The colourful circus-themed décor makes you feel like you are a kid again and has a really good, happy vibe. Sea Circus serves burgers, tacos, salads, share plates, cocktails and coffees- a good spot to stop at between shopping in Seminyak. 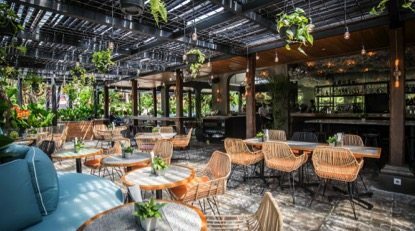 For a casual bite to eat in between your shopping Spree in Seminyak, pop into another one of Zoe’s favourite spots. 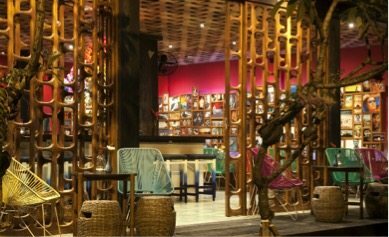 Café Bali is located on the famous Eat Street and close to Seminyak Square so perfect for a pit stop. They have a really large menu with salads, Italian, Asian and European food and very relaxed feel. If you are looking for a relaxed feel with yummy Asian food, Saigon Street offers Vietnamese dishes with a slight twist. Designed to share, Saigon Street’s menu has sharing plates, bigger dishes, an interesting cocktail menu with Vietnamese inspired drinks, good wines, juices and even Vietnamese coffees. Open for lunch and dinner, this colourful restaurant is always buzzing. 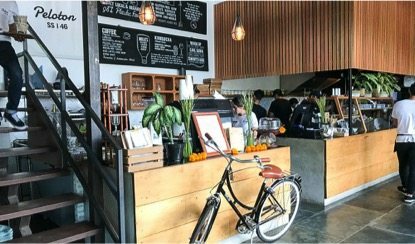 This trendy café, opposite Seminyak Square will make you feel like you are in a coffee shop in Australia. 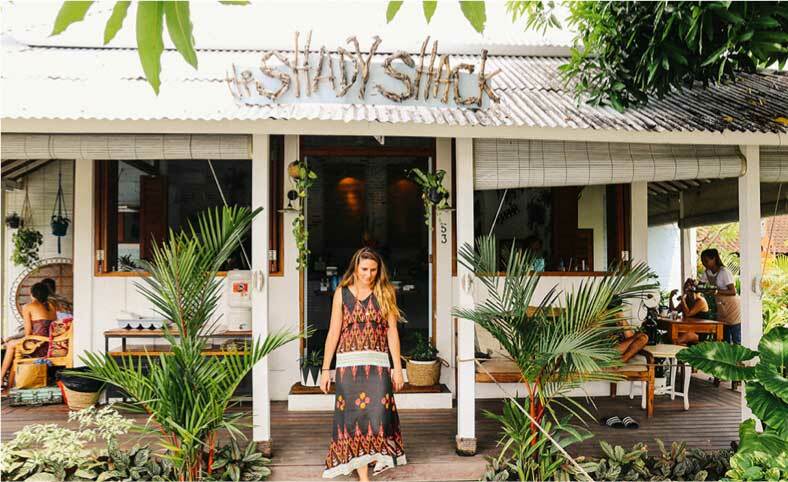 With an all day breakfast menu, delicious healthy lunches, great coffee and fresh cold-pressed juices this is a great stop if you are out shopping in Seminyak all day. Sisterfields has Indoor and outdoor seating, and has vegetarian and gluten free options, catering to all dietary needs. 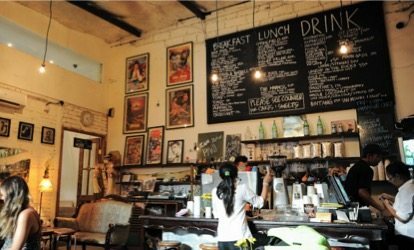 Famous for it’s coffee, revolver is another cafe not to be missed by coffee lovers. Hidden behind wooden doors on a side gang off the main Eat Street, Revolver is always packed and buzzing with tourists for breakfast and lunch. They are also open for dinner and this is a popular spot with a great vibe. 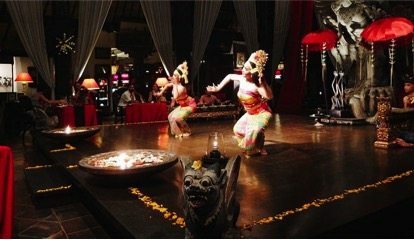 If you are looking for a real Balinese experience, Tugu Hotel offers you dinner and a show. Every Thursday night at 7.30pm the hotel hosts a cultural evening where you can watch a Balinese show with traditional dancers, music and costumes. The service, food and performance is amazing and you will experience a real traditional, authentic night. Bookings are essential as it is very popular. 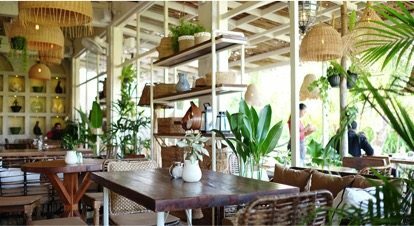 This must be one of the cutest places in Canggu, with rabbits in the garden and an open rooftop to dine directly under the stars. This Warung serves local food with the friendliest staff, calling you by your name through out the whole meal. Prices are reasonable as it is local cuisine with a higher end feel to local Warungs. If you love the Indonesian flavours, Dandelion is worth a visit. When you enter La Laguna you feel like you are walking through a bohemian gypsy wonderland. This space is just gorgeous, overlooking the ocean and is a great little spot for cocktails. 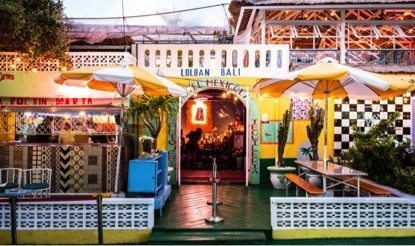 If you are looking to enjoy a few drinks with the sunset and stay for dinner, La Laguna is not far from our Canggu Sanctuary. 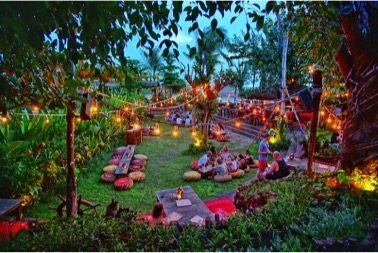 Sit outside on the grass or at cute little tables enjoying the fairy lights and Boho feel but make sure you spray your mosquito repellent as the setting is very outdoorsy. 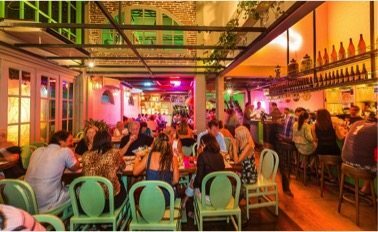 Looking for Mexican food and sneaky Margarita..La Calita is one of the best evening spots for a fun dinner. The atmosphere is great and they have tasty cocktails and awesome Mexican food. 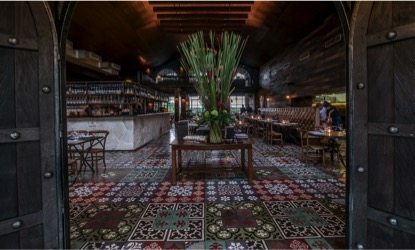 There is a La Calita in Canggu, La Calaca in Seminyak and La Casita in Ubud so no matter what Sanctuary you visit you can always get your Mexican fix. 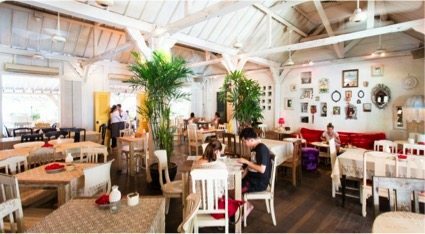 Half way between Seminyak and Canggu, Nook Restaurant is a quiet place to escape the shops, tourists and the Bali traffic. 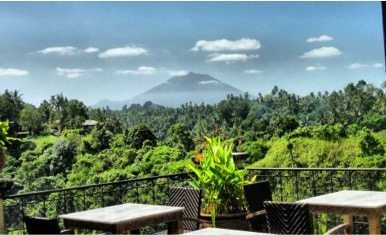 Sit outside with an incredible 360- degree panoramic view of the rice fields and enjoy Indonesian and Western infused cuisine. Perfect for breakfast , lunch or dinner. 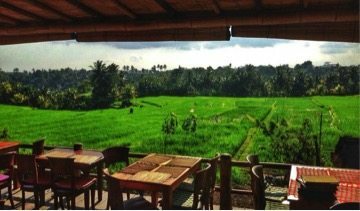 About 10min stroll from our Canggu Sanctuary, Nook’s sister café Milu has the same rice terrace view, yummy food and great spot to enjoy some time outside. Enjoying a coffee or fresh juice, take a book or write in your journal and enjoy the quiet outdoors. Based in Canggu Milk and Madu (which translates to Milk and Honey in Indonesian) is a perfect breakfast spot. It’s always buzzing with a lovely open air, outdoor dining area and this café makes one of the best coffees on the Island. Sunday brunch, with an acoustic band is always a happening event and they always have fun specials running so check their website for what’s hip and happening. Another incredible, outdoor spot for the health food lovers. This café offers incredible breakfasts, lunches and dinners and their juice and smoothie menu is amazing. This is a great spot for vegetarians and vegans and they have the most decadent display of raw and vegan desserts! You have to give this one a try! 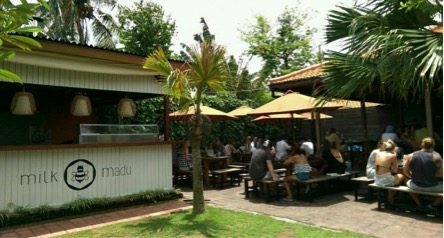 This is another trendy, Australian-vibe café located both in Seminyak and Canggu. This vegetarian café has amazing smoothie bowls, juices, kombucha, coffee, salads and all day breakfast. 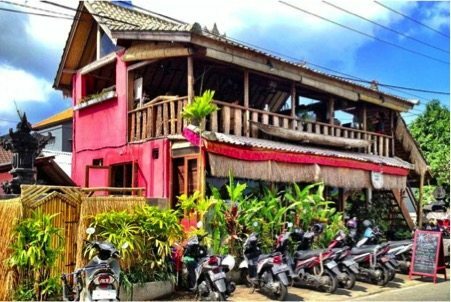 Located on the trendy street of Batu Bolong in Canggu, this café is cute and really healthy. It caters to all diets and has vegetarian and vegan options on the menu..and even some raw dishes too! Great salads, wraps, burgers, Mexican and healthy bowls. 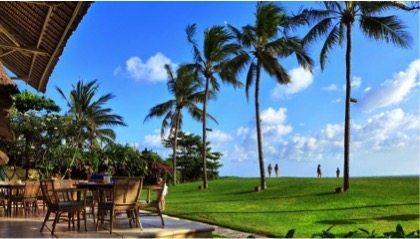 Sip on Wheatgrass shots, Juices, Smoothies or even a cold Bintang and enjoy the simplicity of Bali. For our Vegan ladies, Pelotan is always busy and serves incredible food. Even for those who are not Vegan… Pelotan’s menu could easily blow your mind. Half way between our Canggu Sanctuary and Desa Seni Yoga Village, this is a cute spot to grab a coconut milk coffee and write in your journal after a morning yoga class. 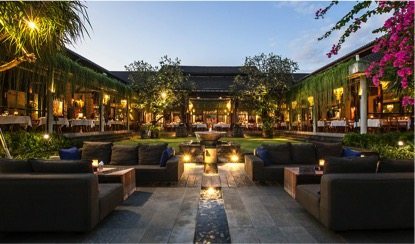 Ranked in Asia’s top 50 best restaurants, this is a high-end, fine dining restaurant in the heart of Ubud. Choose from a 5-course or 7-course meal matching your food with your drinks, they even have a vegetarian tasting menu for the plant lovers. The restaurant is quite small and you need to book a few days in advance to secure your spot. This is a real foodie experience. 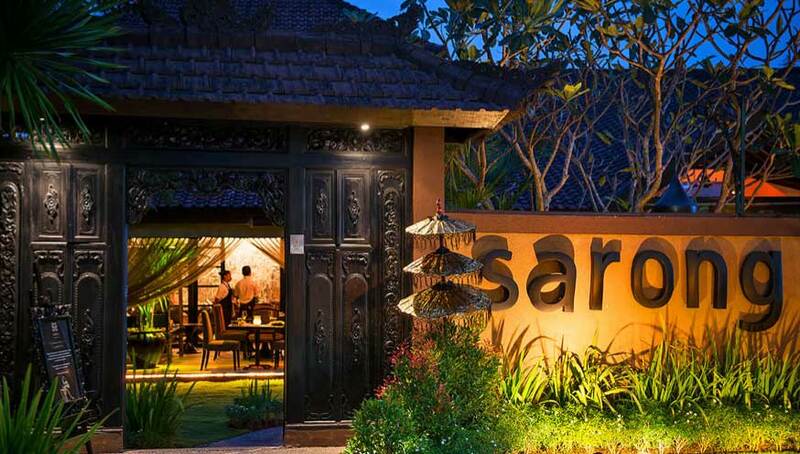 Another fine dining experience just a short drive from the busy Ubud centre. 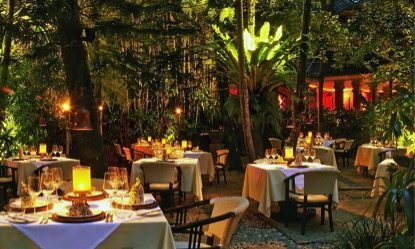 This restaurant is probably the best rooftop experience in Ubud and feels like you have walked into a jungle garden. Copper has a sophisticated yet relaxed feel and the chef may pop over to your table and ask how you are enjoying your meal. Another great spot for the foodies. 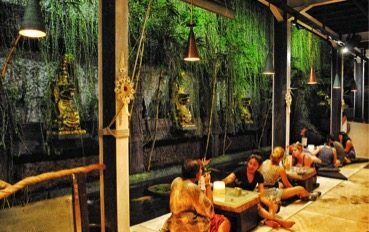 This garden restaurant and bar is tucked away in the quieter parts of Ubud, removed from the tourists and busy streets. The menu is a combination of French cuisine incorporating local and exotic Balinese flavours. Make sure to enjoy a cocktail in the lounge area with hanging crystal chandeliers and plush sofas before you have your dinner. Choose to dine in the in the red walled pavilion with satin table cloths or the gorgeous garden with candlelit tables, fire torches and round rattan chairs. Mosaic has won lots of awards so be prepared for a pricey menu, but well worth it! 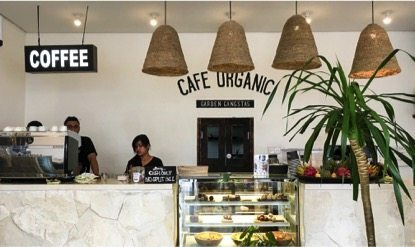 This is Ubud’s first completely raw and vegan restaurant. Alchemy grows most of their vegetables in their organic farm in the hills of Bali. They have a salad bar, a juice and smoothie bar, a vegan coffee corner and even a raw chocolaterie. If you are looking for a serious health kick, check out Alchemy for breakfast, lunch or dinner. 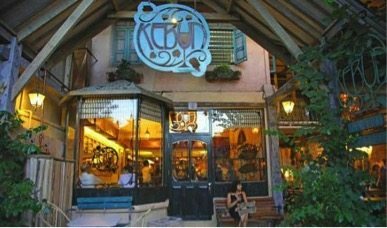 This café is great for breakfast, lunch and dinner and is a hot spot with expats and health food lovers. Walking through the large round circulating wooden door it feels like you are entering a magical hide away. You can sit on cushions on the floor, next to the Koi pond, at a long table downstairs or walk up a the vine covered staircase to the upstairs seating. 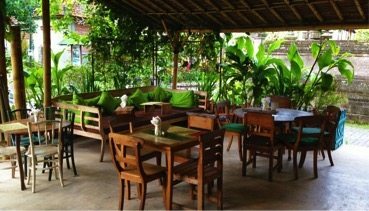 Great healthy food, juices and smoothies, a perfect spot after visiting the Ubud Market. If you feel you need to escape the busy streets in Ubud centre, this hidden gem will give you the space to relax and refresh in the middle of nature. There is no car access to this restaurant so once you get dropped off at the main road, you can enjoy a slow meander through the rice fields on a gravel road just wide enough for one scooter. Enjoy lunch or dinner or a fresh coconut overlooking the rice paddies. The food is local and fresh and this is a great Balinese experience. Another one of Zoe’s favourites, this is a brilliant spot to escape the crowds and enjoy lunch with a view. You can choose to sit in the lower or upper seating and you can look out over the treetops and enjoy the view of the beautiful river bellow. Enjoy local flavours or chose from the Western options, they have vegetarian so cater to all dietary needs. Paris meets Bali. This bistro is all about fine wines, artisan food, pizza, pasta, tapas, and everything Mediterranean. 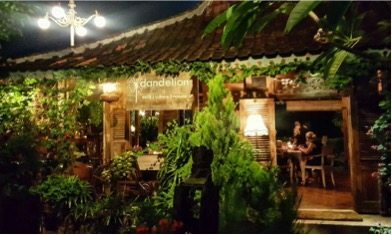 In down town Ubud, this is a great place for a good glass of wine or a French dinner with a beautiful European feel. It has relaxed feel and the staff are really friendly. Sit outside and watch the people walk by.